Today's post is about fossil preparation. When I first started collecting fossils, I wondered how some of the museums got such nice trilobites. Who was finding these fossils intact like that with so much detail? After many field trips and considering myself luckily to find just a trilobite fragment, it dawned on me that these museum fossils were not found in that display state. As it turns out,there might have been just a small area showing of the fossil when it was found in rock matrix. It was the skill and patience of a determined preparer who coaxed the fossil form to appear from its stone tomb. After that I realized that finding a good fossil is just the beginning, cleaning is where the work lies. First off, we begin with safety. Everyone needs to wear safety eye protection when working with rocks. When using picks, knives, screw drivers, chisels, engravers and other tools pieces of rock can fly out and hit the user or observers in the eyes. So they must be protected! It is also possible the tool can break apart and pieces fly off. 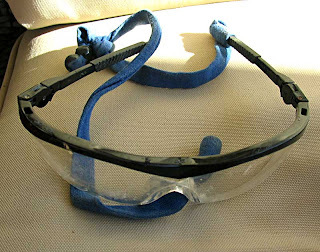 Here is a pair of safety glasses I use. 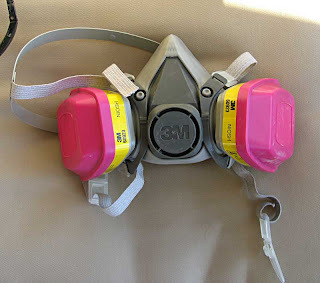 The second piece of safety equipment I use is a 3M dust mask. You need to wear one of these when using a Dremel brush to remove matrix from the fossils. I also wear it when using the sand abrasion cleaner. 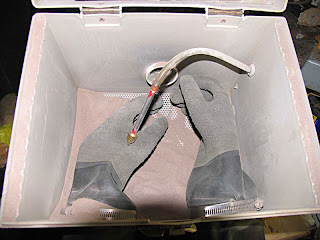 Even though it is in a box and under vacuum, it is best to take precautions to prevent breathing in any lime or dolomite dust. Of course, when I put on the mask, I have to say some pseudo quote from the Star Wars movie like "Luke, I am your father" or "All too easy" after finishing cleaning a fossil. 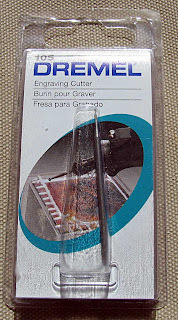 This picture shows the Dremel engraver I use. It has 5 levels that allow adjustment to the force/frequency of this micro jack hammer. It has a modified tip on it. An idea I got from a blog reader, Howard from Calgary, Canada. 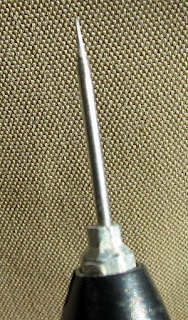 He modifies metal rods to make fine engraver tips. Here is the original tip that is useful for removing large sections of rock but somewhat cumbersome when trying to remove matrix from small crevices of the fossils. 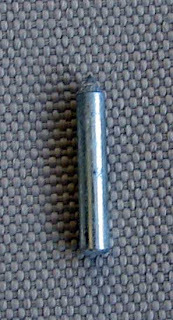 The modified bit is actually an old engraving cutter (bit 105) from the Dremel drilling tool. The small cutting ball wore off the bit just leaving a sharp point. At the time, I could not think of a use for it but put it back in the Dremel toolbox. After obtaining the engraver and learning what Howard was doing with a sharper, fine pointed engraver bits, it gave me the idea to re-use this part. As always wear safety glasses because the tip could snap off during use and hit something. Here is the Dremel bit installed in the engraver. If I run into any micro-vampires, I am ready for action! After removing larger pieces of matrix from the fossils, in my case Ordovician brachiopods. I switch to the Dremel drill tool This one has a stainless steel rotary brush installed. At this point, in addition to safety glasses I put on the dust mask and use it out side to keep the dust out of the house. 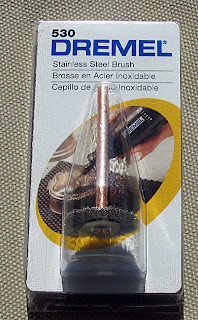 Here is a picture of Dremel attachment 530, Stainless Steel Brush. I was using the Carbide Steel Brush but it quickly lost its bristles after cleaning only 3 brachiopods. I have another Dremel steel brush in a different configuration. Once I finish brushing the specimen, I take an old toothbrush and dip it in diluted white vinegar (acetic acid) and clean the fossil surface. I then dip the fossil in water to clean of any dust and vinegar. 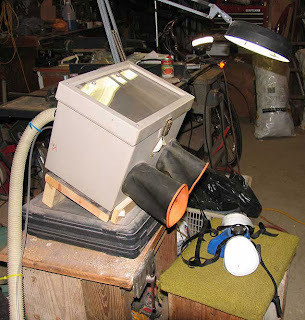 The specimen might still need to be air abrasive cleaned which takes me to my cousin's garage. The fossil then needs to be cleaned again with water and should be ready. In the past, I tried to clean the fossils with just the air abrasive cleaner but it takes too long to clean large matrix areas. So the method I use now is a multi-step procedure involving a combination of cleaning techniques.